Our product range includes a wide range of tyre killer. We are one of the most esteemed names in the industry for the manufacturing, trading and supplying of the best quality range of equipments like Tyre Killer. The offered range is fabricated using premium quality raw material and sophisticated technology. 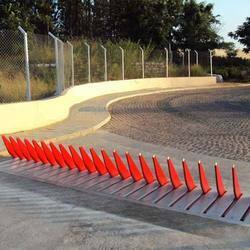 Hydraulic Tyre killer is the most secure system in case there is a threat of vehicle attack in addition to the control of vehicle access in high security applications. Looking for Tyre Killer ?